Yesterday was World Ranger Day, recognizing the dangerous, often deadly job that game rangers in Africa face trying to stop illegal wild animal poachers. These soldiers for wildlife put their lives on the line to protect endangered species that are being slaughtered for their falsely claimed medicinal value (rhinos killed for their horns for bad Chinese medicine, elephants killed for their ivory tusks for the illegal ivory art trade, lions and leopards killed in illegal trophy hunting, tigers killed for their blood and bones–again for false Chinese medicinal claims of virility. Seriously guys, take a freaking Viagra). In 2012, 41 game rangers were killed in the line of duty trying to stop the poaching. Rhino Force, in partnership with Save the Rhino, is a brand awareness program going international to shed light on the plight of endangered and rapidly diminishing rhinos. Their main fund-raising item is the hand-beaded Rhino Force bracelet by Beads for Change, that gives part of the proceeds from these African made art pieces to relocate and protect rhinos (most of the rest of the price goes to education and materials as well as paying fair wages to the local artisans). In addition to Rhino Force, there are other cause-related bracelets: Ocean Force (benefiting Project Aware), Cycle Force (benefiting Qhubeka, mobilizing people with bicycles), Earth Force (benefiting African green and eco foundations), SA Heritage (giving donations to FEED SA and other South African service organizations), Literacy (funding reading programs), and Love 4 Life (donating to medical charities). Wear your cause on your arm, give while you get, and work in varied and focused ways to affect change in our environment and global culture. Thank you so much for your support. 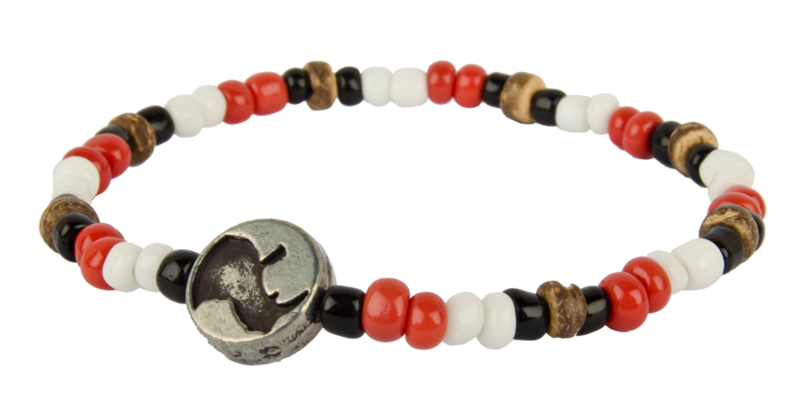 Our simple RHINO FORCE beaded bracelet is making a big difference in conservation. People love to wear the bracelet to show they care.